Factory testing of the IAC "Makhachkala" is scheduled for July 2012. State testing — in August of this year. 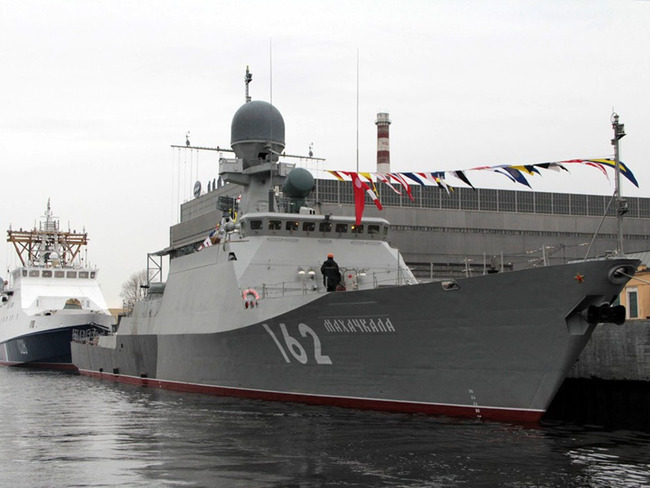 Acceptance of a ship in the Caspian Flotilla is scheduled for completion by the end of 2012. "Makhachkala" designed FSUE "Zelenodolskoye Design Bureau" (Tatarstan). Ships of this series builds of "Shipbuilding Company" Diamond ". This is the third ship of the "Desperado". First — IAC "Astrakhan" became part of the Caspian Flotilla in 2006. Second — IAC "Volgodonsk" became part of the Russian Navy at the end of 2011 and is now preparing to move inland waterways on the Caspian Flotilla. The ships of the "Desperado" are equipped with unique propulsion units consisting of two water cannons, they provide a vehicle not more rain on the go. Due to the low rainfall and high maneuverability, the ship is able to solve a wide range of problems in shallow water in the coastal zone of the Caspian Sea, on the river and in the estuary, as well as other "narrow" water areas. The ship is equipped with a powerful armament, were able to deliver effective fire strikes on enemy ships and shore fortifications to clear the springboard for amphibious landings. The architectural appearance of the vessel meets the requirements to reduce radar visibility, thanks to the use of "stealth".